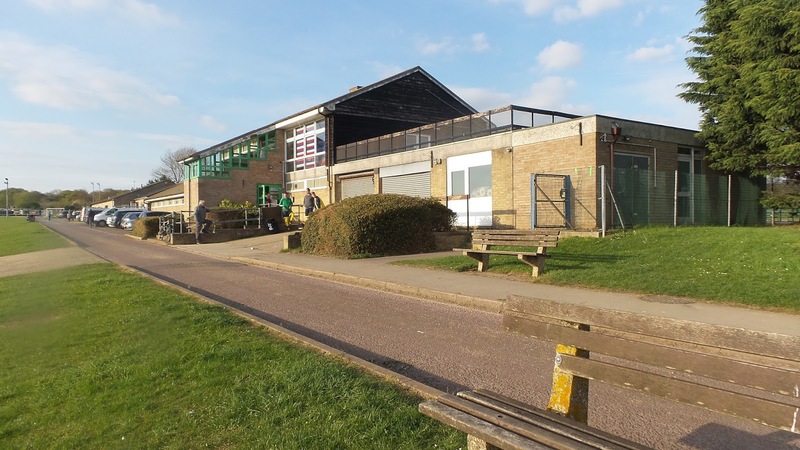 The club was formed in 1949 and were originally named BRITANNIA FC after the local pub at which they were established. After years of success in local Oxfordshire leagues, they joined the Hellenic League in 1988. It was a great first season for them as they finished runners-up in Division 1 behind Almondsbury Picksons. 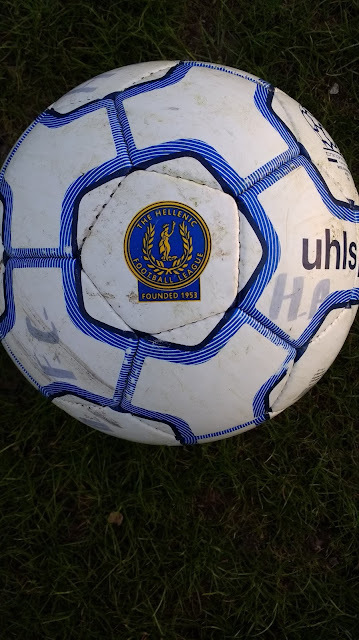 They'd enjoy a five-year spell in the Hellenic Premier and although they generally struggled at the higher level, the real highlight was a 5th placed finish in the 1990/91 season. They were relegated to Division 1 in 1994 due to lack of floodlights and other ground grading issues and the ground has continued to be a real issue for them. Forced to move due to the local council wanting to redevelop land on which their ground was on, they were promised a ground that would be fit for Hellenic Premier football. 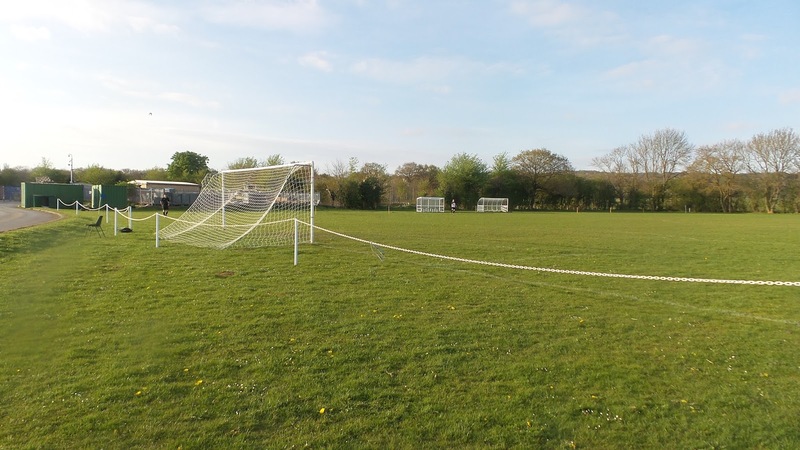 However, the council and property developer reneged on their promises and they are left with a basic grass pitch that is not up to scratch for their current level. Fellow hopper and friend Laurence Reade's blog goes into more detail on the matter. It's a real shame, as the team are more often than not in the top half of the table and were champions in 2011. This season they are sitting in 3rd place in the Hellenic D1 East, well behind the top 2, but well ahead of 4th place. 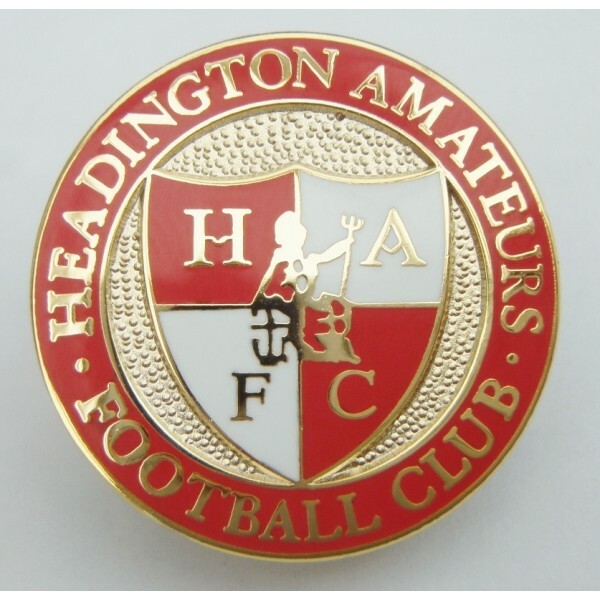 Headington Amateurs have had just the one season in the FA Vase. They made a good fist of it in 1990/91, reaching the 1st Round. They beat the wonderfully named 'Flight Refuelling' from Dorset 3-2 after a replay. Next up was a trip to the Isle of Wight and a 3-1 win over East Cowes Victoria Athletic. Their dream ended against Newbury Town with Headington losing 1-0 in a replay after the original game was drawn 1-1. Local cup honours include the Oxfordshire Senior League Presidents Cup, Oxfordshire Senior League Clarendon Cup, Hellenic League Supplementary Cup, Oxfordshire Challenge Cup and Oxfordshire Intermediate Cup. Both of my regular hopping pals were busy on this day, so I knew I'd be on my own. I wanted to keep the costs low and if possible travel south, but that left me with very few options. Visits to Arundel, Clanfield 85, Wokingham & Emmbrook and Headington Amateurs were considered, with the latter two going to a poll as they were by far the closest. Headington were winning anyway, but Wokingham tweeted me that their fixture was likely to be reversed and played at Sandhurst Town, which I had already visited, so the decision was made for me. 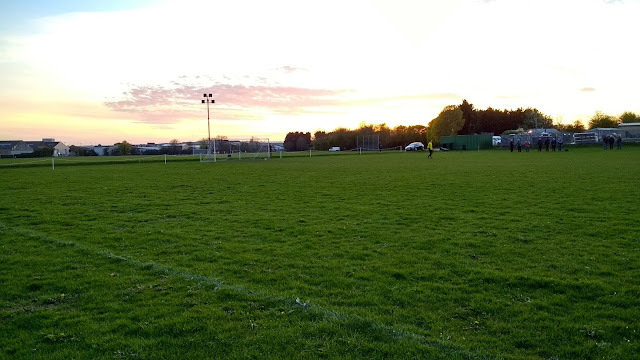 Whatever ground I chose, it would be basic and with no floodlights, but at least the 6.30PM kick-off would mean that I'd be in nice and early, a good thing with me having another game in Coventry the following day after a 4 am start at work in the morning. The day of the game saw the usual routine of my day off and a walk down to Wycombe where I picked up some very nice Peri Peri chicken for lunch. I came home and made good progress on my blogs, finishing the researching the history of all six new clubs I was due to visit this week. I left at 5.25 and thanks to good traffic, I was at the ground by 6.10. There were quite a few other hoppers present, mainly from the Midlands as although it wasn't the greatest ground, not many had 'ticked' it. 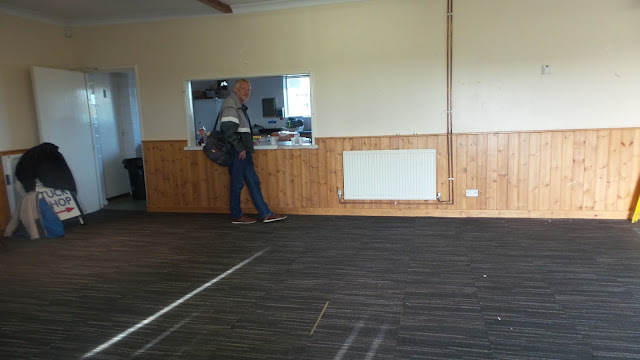 I went over to watch the game, getting there just as the teams came out. 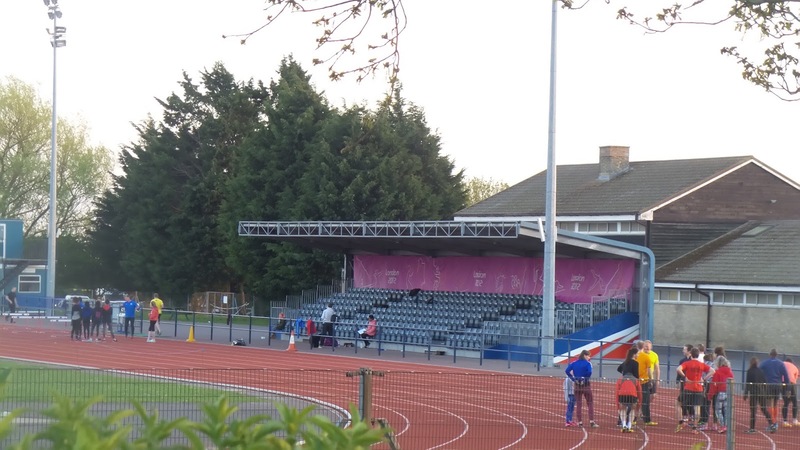 I noted the floodlit athletics stadium across from the pitch where the game was being played. That was lined up as Headington's new home. 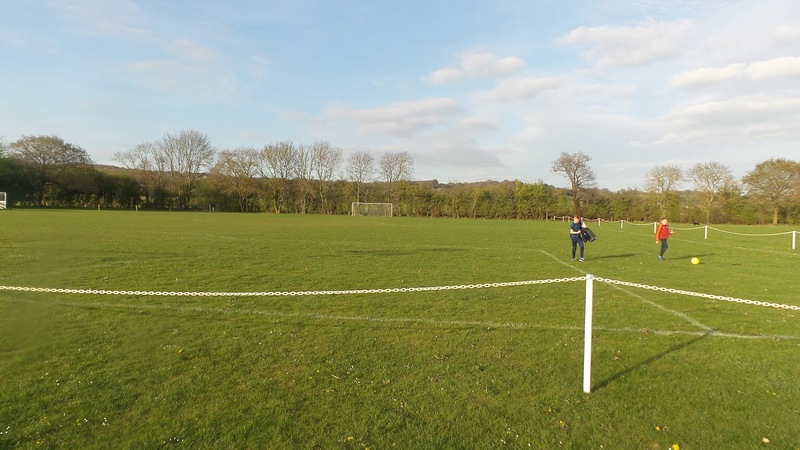 However, there was a shotput area on the grass area that would have been the pitch. Despite the council having done well out of the deal already, they refused to pay yo have it moved, rendering the stadium unusable for football. The game started with the visitors dominating and they took the lead on 17 minutes when a cross was headed into the bottom right-hand corner. Headington Amateurs equalised against the run of play on 28 minutes when a home player shot on the turn from around 10 yards. 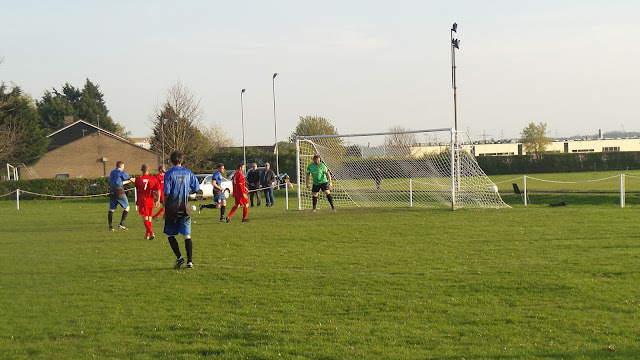 AFC Aldermaston restored their lead four minutes later when their number nine finished confidently from the edge of the area. It stayed that way until the break, In the second half, which kicked off a little early to make the most of the light, it was a lot more even, if anything, the hosts shaded it. They got their equaliser with 15 minutes to go with a low shot from around 8 yards. That was how it ended, with the match ending in very low light. I made my way home, listening to news that the Dortmund game had been postponed due to a few explosions near their team coach, though thankfully no one was hurt. I got in at 8.55, writing my blog and catching up on all the football scores before going to bed around 10PM. 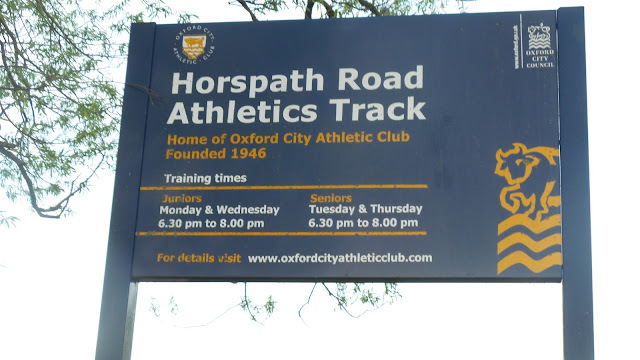 HORSPATH SPORTS GROUND is a very basic venue. 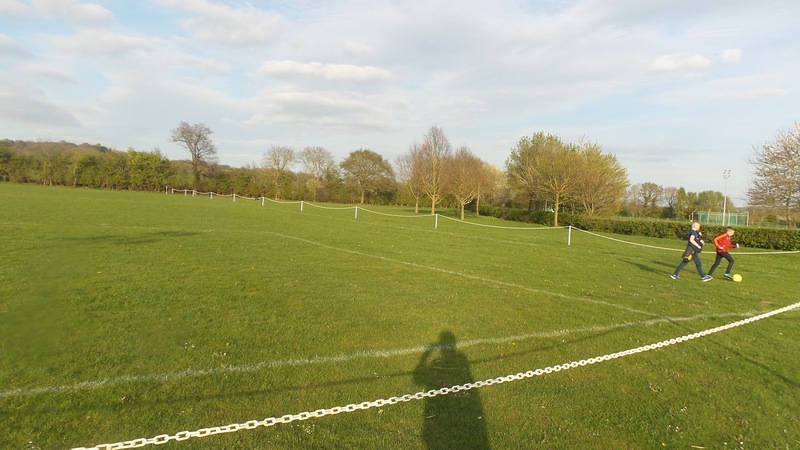 The pitch has a rail of sorts on three sides - two of them plastic chains and the other a rope. The far goal is hemmed in, so is unavailable to spectators, officially anyway. There are no lights, seating or cover. 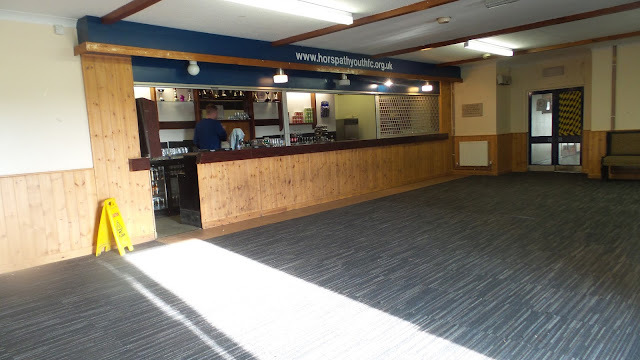 There is a building with basic tea bar and bar facilities and with nothing near the ground that I saw, these may be your only options for food and drink.